Oh dear, i think i'm having one of those crazy days where overwhelm has finally taken a backseat to 'crazy lady lets just go with the flow' mode. I'm kinda liking it. Ok, so the fact that I have Michael Buble playing in the background as I write may have something to do with that. 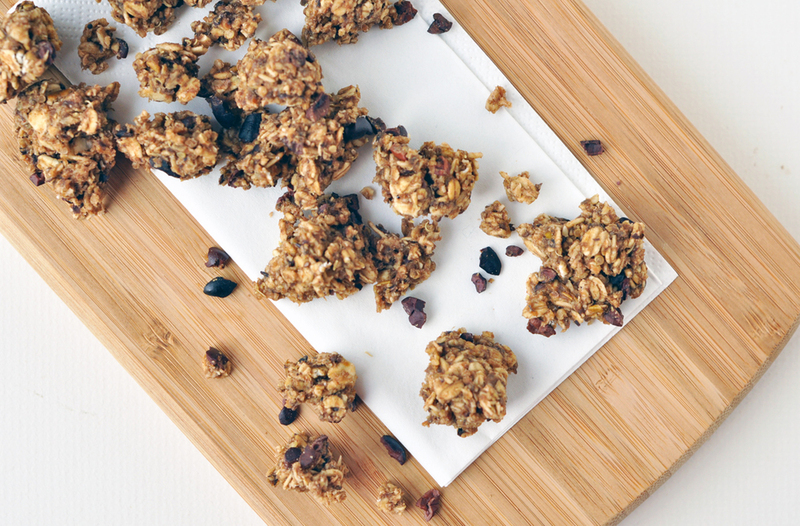 We're talking granola today, but not just any kind of granola. This version has super powers! (kind of). In a nutshell I have cooked up a batch of regular granola clusters, the regular granola you all know and love BUT I infused it with all the super foods I had to hand plus a boost of quinoa. Note, there are no hard and fast rules here just mix in a bit of whatever you have and taste test as you go so you can tweak it to your liking! I appreciate that some super foods can have pretty powerful flavours! I didn't add greens powder because i was scared too- my granola was of the semi sweet variety. But feel free to do so.....? The key thing here is to bake on a super low heat so as much of the goodness as possible is retained the lower the better basically, for as long as it takes to dry out to your desired consistency. I tried this win both the dehydrator and oven and both ways work well. Obviously it does't need to be clumpy if you prefer smaller flakes, it will dry out more evenly that way too. What are your favourite 'super foods' to add to recipes? I'm always a cinnamon and maca girl. Superfood granola... baked on the low! Mix the dry ingredients in a large bowl. Puree the banana/apple and dates and then mix through with the dry ingredients until well coated. Add the seeds last. Using a low temperature helps preserve as much of the superfood goodness as possible! Easy homemade body butter...the perfect Christmas gift!